Learn more about how asphalt roofing contributes to energy efficient and sustainable building practices. Asphalt shingle recycling is cost competitive, convenient where available and saves valuable resources from being sent to landfills. Recycled resources are most commonly reused in pavement, which offsets the need for newly mined asphalt, and additional uses are being explored. Asphalt shingle recycling creates jobs for recycling locations and reduces costs for paving. 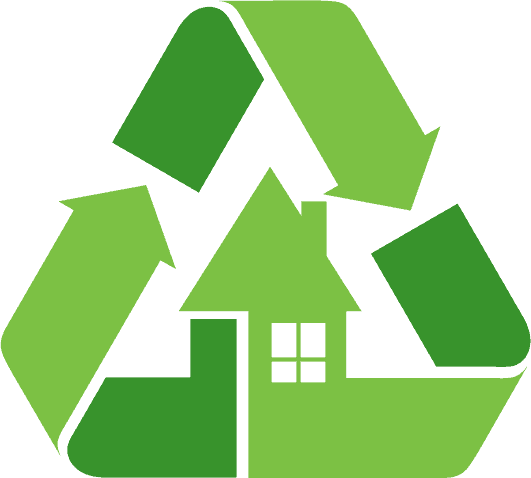 Recycling shingles also allows homeowners to feel good knowing that their used shingles are not ending up in a landfill. 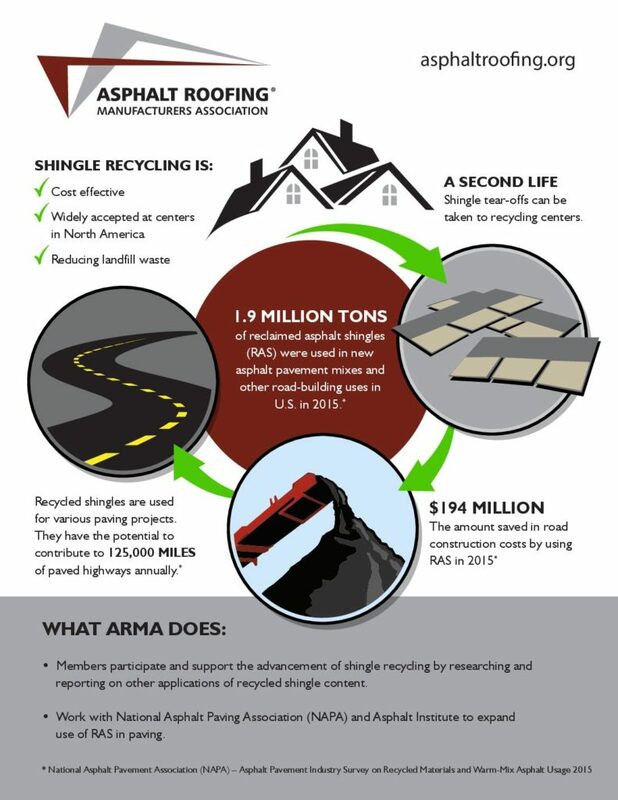 This infographic illustrates the asphalt shingle recycling process and its benefits to the environment. 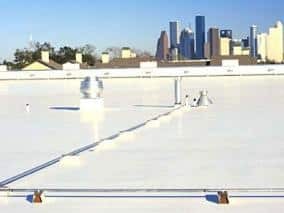 ARMA views roof surface reflectance as but one component of the Whole Building Envelope Approach as an appropriate regulatory policy and design principle for energy conservation, mitigation of urban heat islands, and improved air quality. The Whole Building Envelope Approach is the best option for designing and optimizing performance-based, proven and cost effective commercial and residential buildings. It allows flexibility and consumer choice in the selection of roof systems. The 2008 California Building Energy Efficiency Standard for Residential and Nonresidential Buildings (2008 Title 24)is the official code passed by the state and the 2008 Residential and Nonresidential Compliance Manuals are guidance document that helps explain the code and answers some commonly asked questions. The 2008 Title 24, Part 6 Standards are broken down into two segments, Residential and Non-Residential. Title 24, Part 6 is California’s Building Energy Efficiency Standard is the section of the code relevant to the roofing industry as it includes performance and prescriptive requirements pertaining to roof assemblies. The Asphalt Roofing Manufacturers Association (ARMA) partnered with ASTM International to develop Product Category Rules (PCR) for asphalt roofing in North America. 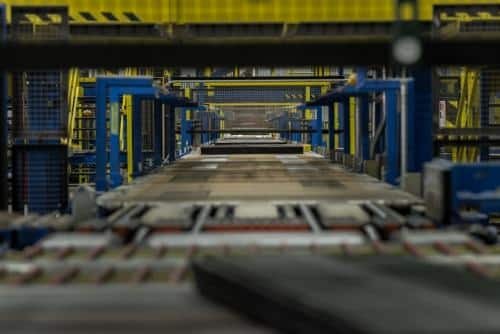 The asphalt roofing PCR provides consistent methodologies for asphalt roofing manufacturers to measure and report the expected environmental impact of their products. This document can be accessed for free on ASTM International’s website (www.astm.org/certification). ARMA has completed a multi-year effort to develop Environmental Product Declarations (EPDs) for asphalt roofing systems. These five new documents provide information that building and construction professionals can use both to support environmental aspects of roof systems as part of sustainable building projects and to better understand their impact over time. EPDs are now available for asphalt shingle roofing systems, SBS and APP modified bitumen systems, and built-up roofing systems.